It is always said “the gift of a man will make way for him” but this is not always through especially for those who don’t know how to monetize their talent. As easy as it is monetizing talents, most youths still find it impossible to make money from what they love to do and those that are making money are being underpaid. You see there’s a huge difference between having talent and knowing how to use it to fetch money but I guess you’ve realized this that is why you’re reading this post. Don’t worry the solution is here in this compiled post. Don’t beat yourself over this. It’s something that can change from today and forever cuz I’m going to open your eyes to few things you’ve seen before. Talent is inborn. It’s something that comes naturally that’s why you don’t think too much to make it happen but every other thing that comes with it like knowing how to make money from it; you have to learn. This is the major reason we need others especially those who have found their way around this and become world famous in their fields. The others I’m talking about here are mentors and the medium they use like blogs (to teach) and the social media (to connect) and also one on one counsel. As for the mentorship under AgidigbaMEN blog, that will be starting when our target audience increases and becomes a community. Now, how can you make money from your talent? It first starts with patience. Yes, little drops of water make can make might a river they say. So I’m giving you this advice for free – take your time and don’t compare yourself with other players. Your time will come. In fact, your time is now. You just need to focus on yourself and know what you want from life. Now that we’ve established this, let’s move to the making money part of your talent. Yes, if you really want to start making money from what you love to do; you need to start doing everything to stand out from the rest (others in the same talent with you) and the only way you can do this is to practice more, watch Youtube videos, attend seminars, and training. I’m not surprised C.Ronaldo is where he is today because according to his biography he spent most of his time on the pitch than outside the pitch (during the early days of his carrier). He knew success doesn’t come by luck but by hard work and focus. So practice all day and night. Make sure there’s no new technique, move, or method you don’t know on that talent you’re exploring. So that by the time you finally come out to show the world what you have you’re going to come out big. Great pop legend like Michael Jackson also stood out (from other performing artists) because of the huge time he invested in being a better version of the regular American artist. Spend extra hours and burning the midnight oil. If you practice 2 hours every day increase it to 5 hours, and if you’re already there step it up to 7 hours. Point of Emphasis: The difference between an average footballer and a professional football player is the time they put in to practice. Understand this first step and you’re on your way to wealth. I have seen people rise from nothing to something just by branding themselves. Branding is very powerful. It is a powerful tool in the hands of someone who has exceptional talent. However, whether your gift is unique or not you still need to brand yourself. You can make so much money from that furniture you produce or as a pop singer, dancer or chef just by branding yourself. This single step if done well can take you from some who just have an idea to someone that actually knows what he’s doing. And the most amazing part about this step is that you can do this for free (bypassing the heavily paid branding experts in your area) if you know the right sources (where to go). Now that you have worked on yourself to stand out and built yourself a brand, it’s time to go all out and offer trial services. You might say, why should I offer free services? I have worked hard and spent my hard earned money to get where I am. Well, I understand. But you see it is in doing this that you showcase to the world how good you are and get what you want in return – money. So put yourself out there and put your ears on the ground to know those who want you – companies, churches, clubs, brands and so on. And tell them how much you usually charge for what you do but however tell them you’re willing to offer trial services just for them to see how exceptional you are. If you’re a keyboardist tell the band that you want to play for what you usually charge but then tell them you’re willing to offer a trial service. This method is for them not to price you down but to make them pay you whatever you ask for. This marketing technique has worked for producing companies like windows and servicing companies and it sure works in cases like this because I’ve tried it before. So do not look down on this tool. Like I said earlier producers use it to launch their new product. At the end of the third step, you should have started making good money but there’s one final thing you need to do. And that is charging on demand. At this stage, you need to increase your standards and charge more for your gift (yes, at this stage your talent is now a gift). 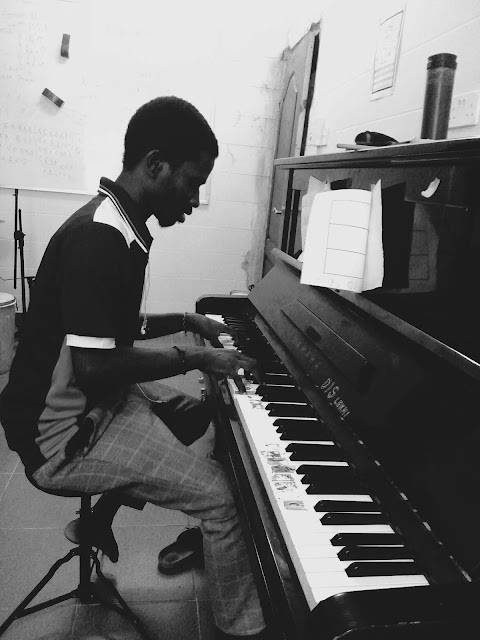 If your band pays you ₦100,000 to play keyboard, there will be another band that can pay more if not double. So continue to charge more, ask for more and continue to work on yourself because to demand more money is to deliver more service. Continue to do this and you being a millionaire with your gift is just a step further. In all this, don’t forget to add humility and financial wisdom as the how to make money with your talent steps will make you rich but these other two points (humility and wisdom) will keep you rich. Asides all these, treat your talent as a business. Don’t do with it what you shouldn’t do in business and the sky will be your stepping stone. Have you used a method or an idea to make money from your talent? Please share with me. I want to learn from you too and share this article with your talented friends.